Launched on April 16, Balaji’s Alt portal has embraced the digital era by releasing their app and indulging in the changing patterns of how audience consumes content. 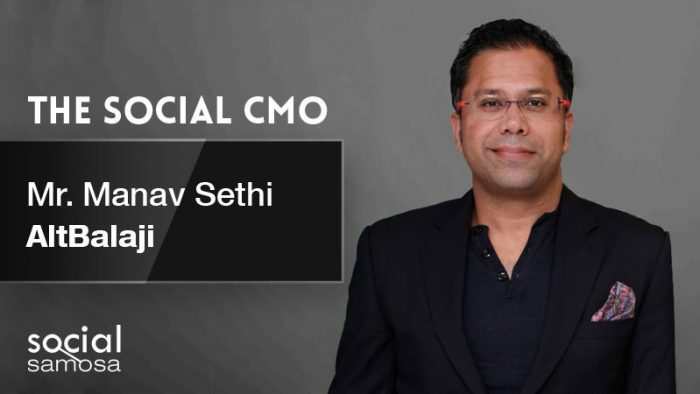 Social Samosa dives into the content mix of the portal with Manav Sethi, CMO, ALTBalaji where he gives insights about content marketing, video content and marketing to millennials. What was the ticking factor that motivated Balaji to take the plunge into the digital ecosystem? India is a single television household and not all kinds of content can be shown on it, so, from a consumption stand point I cannot watch content that I want. The concept of prime time that has been there for eons is no more existent and after our market research we realized that mobile has a far pervasive user-base. With 950 million phones and some 300 million smart-phones we realized there is a far pervasiveness in video content to be consumed and made available on the phone. It was also largely with the fact that we will create stories that have not been told before and create stories that will resonate with individuals rather than families and households. That was the starting point and with that point and the leadership of Ekta Kapoor we went back to create stories and architect the entire pipeline for this particular year. Balaji has worked closely with the television space, so, what would be the core difference between the audience online and that views television? When you sit in front of a television, it is a family consumption of video and not a personal consumption. A significant difference is of the democratization of the entire play, for television the channel and the networks are the owners and the judge of what will go live at what time. Whereas when you are on a platform like Alt, you throw in the shows and you let consumers binge watch it as and when they want and that is the strength that we want to harness. As the CMO of the social media age, what are the social listening tools you’re applying to understand the chatter and the response? So, I’m a neo-classical marketer, which is why when you look at Alt’s launch campaign you will not find a TVC that we made for Alt. As a brand stakeholder, we are of firm believe that our shows are our brand and consumer today is very promiscuous, they’re not going to stay on a brand if there is no underline value prop. So, we have taken a call to be on those platforms where our consumers are which social, digital is and all across such milestones which are heavily trafficking and consumed. Is there any particular platform or ad format that has worked for leads or app downloads? We started from April 16th with the launch of a trailer and out of those trailers we created GIFs and memes. From a platform stand point, YouTube has worked tremendously well largely because it is the largest video consumption universe that India has and that is where the captive entertainment and video consumer audiences are. From an ad format standpoint, we have done YouTube masthead, carousel ads on Facebook and the pre-rolls on YouTube have worked well. What is the marketing mantra? There’s only one marketing mantra- Listen to your consumer. Manav further shared the future plans for ALT Balaji with a few takeaways for the marketers. Watch the entire video here for further insights.